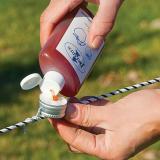 Use apple scent as an aid to train animals that the fence is energized. 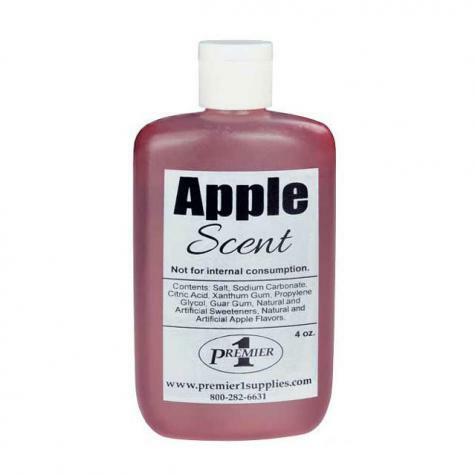 Apple scent entices the deer and other wildlife to sniff the metal Scent Cap and thus receive a strong shock through its sensitive low-resistance nose. It's a less messy, more enduring form of peanut butter. Ingredients: Salt, Sodium Carbonate, Citric Acid, Xanthum Gum, Propylene Glycol, Guar Gum, Natural & Artificial Sweeteners, Natural & Artificial Apple Flavors. Baiting and rebaiting your scent caps is worth it if you value the trees and plants that you are seeking to protect. Isn't it a lot of work to rebait them? Baiting is a matter of walking along the fence; twisting the cap upwards; and squeezing a few drops of apple scent onto the cotton inside the cap. (Turn off the energizer first!). How many scent caps per ft. of fence? You should bait the fence with a scent cap every 50 ft. in heavy traffic areas. Every 100 ft. in less traffic areas. Deer are very sensitive to smell. Make sure to turn off energizer when rebaiting the scent caps.